St Brigid’s Church, Holy Island Clare, Lough Derg. Clare County Council this week announced the appointment of a team of specialists to prepare a Visitor Management and Sustainable Tourism Development Plan for Holy Island on Lough Derg. 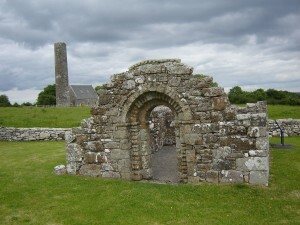 The island is one of the most important historical and ecclesiastical sites in Ireland and was once known as the ‘Island of the Seven Churches’ with links to St Colum and later St Caimin in the 7th century. Buildings on the island include a 24-metre high round tower, an oratory, and a number of churches, four high crosses and a holy well. The cemetery on the island is known as the Saint’s Graveyard is still in use. Holy Island is being considered as a possible UNESCO world heritage site for Ireland as an early medieval monastic site along with Clonmacnoise, Durrow, Glendalough, Kells and Monasterboice. Last summer, Clare County Council acquired 41 acres on Holy Island which, together with the 2 acres already in the ownership of the Office of Public Works (OPW), resulted in the entire island being brought into public ownership for the first time. This week, Clare Clare County Council announced that Dublin-based Solearth Architecture has been engaged to prepare proposals for improving access to the island and for the provision of tourism facilities on or near the island. The plan will also include proposals on the marketing and promotion of the island as a visitor destination, while promoting its historical significance and protecting its built and natural heritage. Speaking this week, the chairperson of Clare County Council and former Independent TD, Cllr James Breen, said he welcomed the progress that has been made in relation to the development of a comprehensive tourism development plan as part of the Council’s ambitious and methodical approach to developing this important site in a sustainable manner. “The sustainable development of the island for the benefit of tourism and communities in the wider Lough Derg area has long been sought by elected members of Clare County Council,” he said.